In March, we received a call from a Pennsylvania couple about to leave the country. They hoped to place Joey, their 7-year-old capuchin monkey, at a sanctuary. Joey was the baby of a black-and-white capuchin and a cinnamon capuchin. Pet breeders sometimes mix species of capuchins to sell for high prices. One website called Primatestore.com markets baby black and white capuchins for up to $7,500. Baby Joey was taken from those black-and-white and cinnamon parents and sold to someone who knew nothing of the care a monkey needs. When the Pennsylvania family acquired Joey, he couldn’t move well or be touched without screaming in pain. A veterinarian diagnosed the young monkey with severe rickets -- a disease of the skeletal system resulting from Vitamin D deficiency and insufficient exposure to sunlight. Rickets caused a softening of Joey’s bones. Joey’s spine is slightly curved, and both his arms and legs are bowed. Two years of medical treatment had Joey living in and out of casts. The new owners supplemented the monkey’s diet with Vitamin D.
On 18 April 2010, Joey arrived at Primarily Primates. 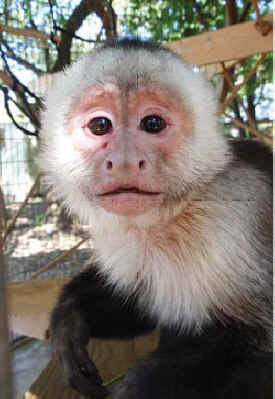 Our first priority was to introduce this confused youngster to Honey, a black-and-white capuchin aged 22. Like Joey, Honey was a pet. For 17 years. Honey couldn’t socialize. But that changed when Honey met Joey. Honey immediately stated grooming Joey and he returned the gesture. Joey picked up on Honey’s food choices, and began to explore new foods. Honey and Joey are now good friends, and rarely leave each others’ side.